I still remember my first full time job out of graduate school. I was admitted to be part of Ingersoll Rand’s financial management program, a rotational program designed to develop future financial leaders of the company. I was one of six analysts fresh to the team and had just completed my first six-month assignment in Allentown, PA. I had done a great job and was feeling confident in my abilities. When it came time to receive our second assignments, my one teammate asked to be sent anywhere in the world. They sent him to Paris. My other teammate asked to go anywhere too and they sent him to London. When I asked, in the hopes of an exotic location, they sent me to the Bobcat manufacturing facility in Gwinner, North Dakota, a town of 700 people and 100 minutes from the nearest city. There I learned all about snow. I also learned about supply chain in a manufacturing facility. It was such an interesting place and although I completely bombed the assignment, I learned a great deal about manufacturing operations. Ingersoll Rand’s major challenge was assimilating Bobcat into their culture and operations. They tried for years but were unsuccessful. 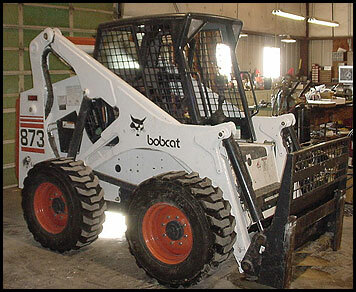 So were the subsequent owners of Bobcat. The systems were antiquated mainframe computers. The top office talent were the sourcing teams, not the accountants. And being that it snowed quite often, getting top talent was a major challenge. Today, these challenges could easily be met. Blockchain technology could be used to create major operational efficiencies. Blockchain would enable contract management, payments, logistics, supply chain efficiencies, and process improvement. It would also enable remote management capabilities and the avoidance of mistakes by undermanned staff. Smart contracts could be be used for plant logistics and inventory management. A blockchain system would create transparent access, whether they are suppliers, vendors, transporters or buyers. And a management team could be located in Fargo, or any other city. Blockchain enables companies with major assimilation difficulties a means to create synergies and correct any inherent supply chain or operational problems. convincing that I never stop myself to say something about it.